There are countless things that attract tourists and winter residents to Great Exuma. From its spectacular waters, beaches and cays, Elizabeth Harbor, the island itself and the people who call it home. 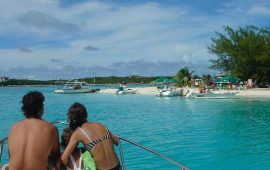 Stocking Island is the largest barrier island to the east of Great Exuma and forms Elizabeth Harbor. Head out there to swim, surf, beach-comb or hang out at The Chat N’ Chill or St. Francis Resort. Any trip to Great Exuma should include a tour of The Exuma Cays. 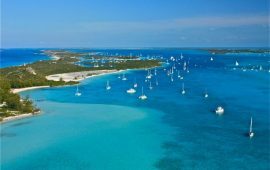 Home to the rich and famous, the cays are also home to very diverse marine life, countless breathtaking vistas, and plenty of fun and enjoyment for folks from all walks of life. A number of tour operators offer day trips to the Exuma Cays (home to the world famous swimming pigs) and private charters are also available. If you are into SCUBA you will love the Blue Holes of the Bahamas. For more information on these incredible caves click here. 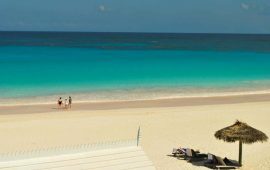 One of the true attractions people have to the Bahamas are its warm, friendly and inviting citizens. 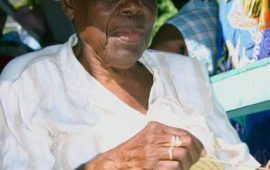 Any time you visit the Islands be sure to engage with those that make the Bahamas truly special. Like nowhere else on Earth! 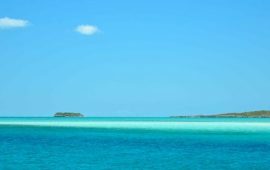 Exuma boasts some of the most beautiful beaches in the world, and definitely some of the least crowded. While a number of beaches including Tropic of Cancer Beach are easily accessible by rental car, the best beaches are ones only accessible by boat so we highly recommend you rent a boat, charter a captain, or join a tour to experience the more hidden gems of Exuma. The harbors of Great Exuma offer protected waters to enjoy all that you would hope to while in the islands! Elizabeth Harbour is easily accessible by rental boat and offers numerous snorkel spots to explore life under the crystal clear water.